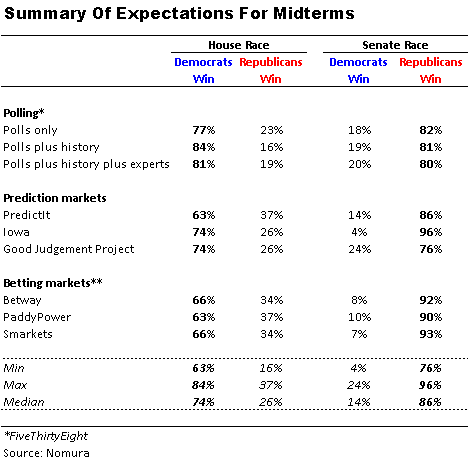 Towards the end of September, I sent out a snapshot of expectations for US Mid-Term elections results. With the elections less than three weeks away, I update the numbers. The main takeaway is that expectations for the Republicans to retain control of the Senate has markedly increased. The median expectation across polling, prediction and betting markets was 71% in my last update – today it is 86%. Despite this swing, Republicans have become less likely to win the House as expectations for Democrats to win the House have (modestly) increased from 72% to 74%. Nate Silver from FiveThirtyEight wrote on this divergence and concludes that there was a Justice Brett Kavanaugh “confirmation bump” in support for Republicans in Senate races but not House races, as Senate battle-grounds are more uniform and demographically-friendly to the Republicans (rural and less educated) than House battle-grounds. Nevertheless, such a swing in recent weeks reminds us that we need to be careful in assuming our base case of a switch in control in the House to Democrats. If we were to see the Republicans retain the House and increase its majority in the Senate, then that could allow the Republicans to push a major legislation through the market. This could include making tax cuts permanent (currently they are out to 2025, see Lew’s note). But the more tricky area would be spending – would the fiscal hawks in the party attempt to rein in welfare and medical spending, or would President Trump try to push through an infrastructure spending bill. The base case of the Democrats winning the House make any fiscal stimulus even less likely, especially if less centrist Democrats win. 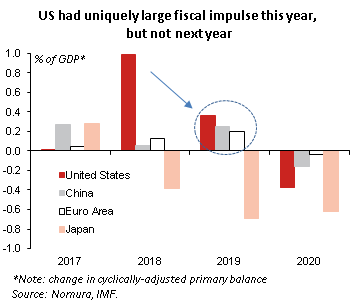 This is important for markets as the US has enjoyed a uniquely positive fiscal pulse this year compared to other countries. While it will be positive next year, it will much smaller and crucially similar to other countries ones too. Therefore an absence of additional stimulus would remove a key support for US markets. As in my last email, I include the latest odds on the next US President. Trump remains at the top, followed by Democrat front-runners Kamala Harris and Elizabeth Warren. 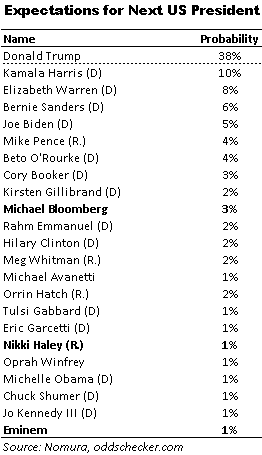 But the biggest changes compared to the last update, is the entry of Michael Bloomberg in at #10. There has been much chatter on this as he re-registered as a Democrat recently. Then the other changes of note are the entry of soon-to-retired US ambassador to the UN, Nikki Haley, a Republican and strangely Eminem has entered the charts too (“The Rock” has fallen out of the table though! ).